There’s a scene at the end of the movie Goodfellas where Henry Hill, the notorious gangster played by Ray Liotta, speaks directly to the camera and laments the sudden end to the life he once knew. “Everything was for the taking. And now it’s all over.” Just like that, with a crack of a judge’s gavel, the high times of Henry Hill were finished. The Nashville Predators and their fans are now feeling a similar type of emptiness after their 2-0 loss in Game 6 Sunday night. For two months, they seemingly had it all. The team was firing on all cylinders, and the city finally caught the attention of the rest of the hockey world. The Cup was theirs for the taking. It was a fun ride, but just like that, the show is over. The lights are out on Broadway. The margin for error in the Stanley Cup Playoffs is razor thin. To win the Cup, you almost have to be perfect, and when you’re not, you have to know how to close. For three rounds, the Predators made very few mistakes. Pekka Rinne was having a resurgence, and the defense in front of him was dictating play on both ends of the ice. Everything seemed to be clicking. The Stanley Cup Final is a different beast, however. The stakes are the highest they will ever be, and your opponent is an unfamiliar foe from the other conference. The Predators looked like a different team against the Penguins, for better and for (mostly) worse. Here are some of the things that went wrong. For three rounds, Rinne looked unstoppable in net for the Predators. The formidable Blackhawks could barely muster three goals, and while the Blues and Ducks put more pucks past him, Rinne still looked like the Vezina-caliber goalie he once was. He was solid, reliable, and consistent, but in the final round, Rinne’s performance was schizophrenic. With an .888 save percentage for the series, he got badly outplayed by a young, hot Matt Murray at the other end. The stats don’t even tell the whole story either. Rinne never quite looked comfortable in net. He was fighting shots and leaving juicy rebounds that should’ve been smothered. His best performances, like that in Game 4, were in front of his own fans in Nashville. The rebound control issues were still there, but he made enough clutch saves to give his team enough confidence that maybe he had figured things out. Rinne played pretty well in Game 6, continuing his trend of solid play at home. 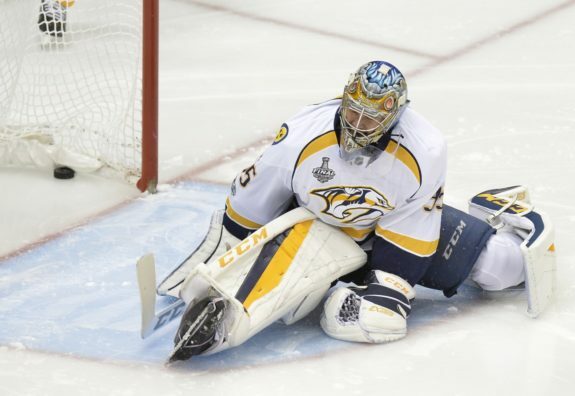 As the game grew more frantic with each passing minute, Rinne came up with a few big saves to keep his team in it. For whatever reason, however, PPG Paints Arena in Pittsburgh was his kryptonite. His mistakes became more amplified, and when they needed a big save (or heck, even a routine one), Rinne couldn’t do it. Game 5, in particular, recalled last year’s drubbing against the Sharks. Rinne couldn’t save a beach ball, and like in Game 2, he had to be pulled from the ice. Rinne and the Predators couldn’t find a way to win on the road, and that was the difference. There is going to be a lot of second-guessing in the wake of Nashville’s season-ending Game 6 loss, and while it’s easy to blame the refs (we’ll get to that in a minute), the Predators had every chance to take the lead and live to see another game. They were gifted four power-play chances, including a 32-second two-man advantage, and they couldn’t capitalize. In the last two games, they went 0 for 8 on the power play. 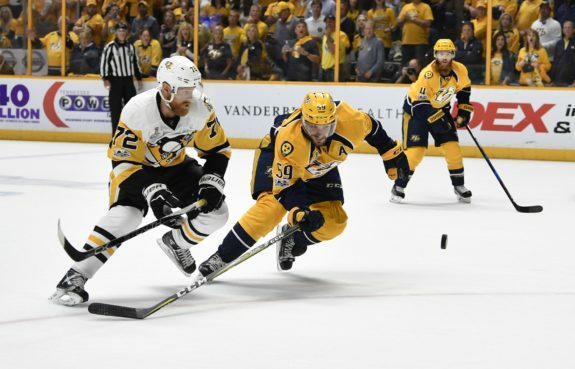 They began to rely too heavily on the point shot, which the Penguins were blocking, and especially during the 5-on-3, the Predators failed to move the puck around down low. And while the Penguins weren’t in great shape on the power play either, even just one goal with the man-advantage could’ve made all the difference. All series, the Penguins showed how good they were at being opportunistic. They didn’t always play their best hockey, but when Nashville faltered, the Penguins took advantage. The Predators had their own opportunities in the last two games, but they wasted them. In this series, the Predators got more out of the stars in the stands than their stars on the ice. Every team eventually encounters injuries during the playoffs. The wear-and-tear is part of the grind. With one of their best offensive players in Ryan Johansen out for the remainder of the playoffs, the Predators struggled to fill his void, and the stars didn’t show up. The Predators are a young team, and they became dependent on the production of their young players. This isn’t necessarily a bad thing. When the goals are coming, who cares where they’re coming from? The problem with the younger guys is that they’re less experienced, and thus more prone to the anxieties of the added pressure. Centerman Filip Forsberg scored 31 goals in the regular season, and racked up 15 points in the first three rounds of the playoffs. He all but disappeared in the Final, managing to score only one goal, which was an empty-netter in Game 4. The Penguins kept him quiet, and Forsberg never adjusted. Viktor Arvidsson, the young forward from Sweden, had his moments. He registered one humongous goal and a pair of assists for the series, but he also was a team-low minus-10 plus/minus. As a coach, it’s hard to trust a guy defensively with a stat like that. It wasn’t just the young’uns who struggled offensively. The more experienced players on the roster couldn’t get the job done either. Guys like James Neal, P.K. Subban, and Mike Fisher struggled to find the back of the net. And the ferocious defense for the Predators that had excelled greatly for the first three rounds suddenly became stagnant. For a majority of the series, the Penguins roughed them up and kept them off the scoreboard. The defensive core for the Predators broke down, and they couldn’t contain the high-flying Penguins offense. The star power of the Penguins was just too great. 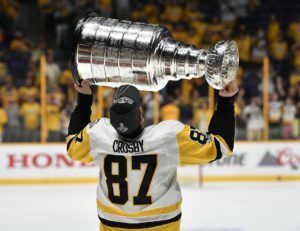 With all due respect to the stars on the Predators, in no way did they stack up against Crosby/Malkin/Kessel, not to mention their young kids like Jake Guentzel, Conor Sheary, and Matt Murray, who remained hot all series. Most of these guys are bonafide superstars, the best of a generation in the prime of their careers. When they’re on top of their game like they were in the Final, there’s no lineup in the league that comes close. Sometimes the pucks just don’t go your way, and sometimes they do but then they get waved off. It’s no secret the officiating in the NHL is under scrutiny. Every game seems to have a different rule book attached. Imaginary conspiracies aside, the Predators did get hosed on a couple of terrible calls, but it’s hard to blame the refs themselves. While the overruled Subban goal in Game 1 was bad, the call in the second period of Game 6 is what will mainly stick out in the minds of the Predators. What should’ve been a Colton Sissons goal was waved off because the referee blew the play dead when he lost sight of a puck Murray never controlled. While the whole “intent to blow” rule is dubious at best, the call on the ice is technically the correct one. In what turned out to be the closest game of the series, a 1-0 lead early in the game for the Predators could’ve changed everything. The ref made a glaring mistake at perhaps the most crucial moment of the season. Had he waited a split second more, that goal counts. How many times during the course of a game do you see the refs take their time blowing the whistle? Heck, even later in the game, Murray grabbed a puck out of the air with his glove and the refs waiting a couple of moments to call the play dead. It’s inexplicable why they were so trigger happy on the Sissons goal. Of course, in a tight game like Game 6, all it takes is one bad bounce to go against you. That’s exactly what happened on Patric Hornqvist’s game-winning goal late in the third. 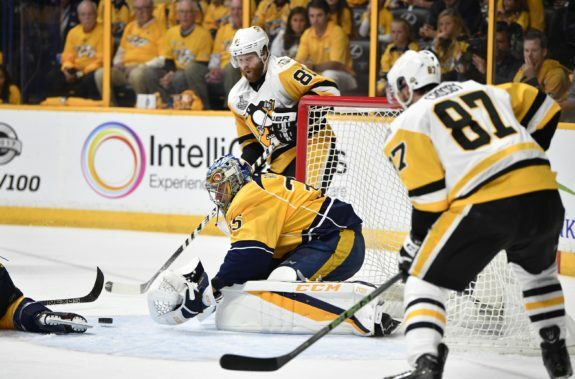 The Predators seemed to have everyone covered, but a shot from the point careened awkwardly off the boards, bounced off the back of the net, and found Hornqvist’s stick. The play happened so quickly, and Rinne couldn’t adjust in time to get back to the net after the initial shot, and Hornqvist swatted the puck off Rinne and into the net. It was an oddly fitting ending to an unpredictable series. 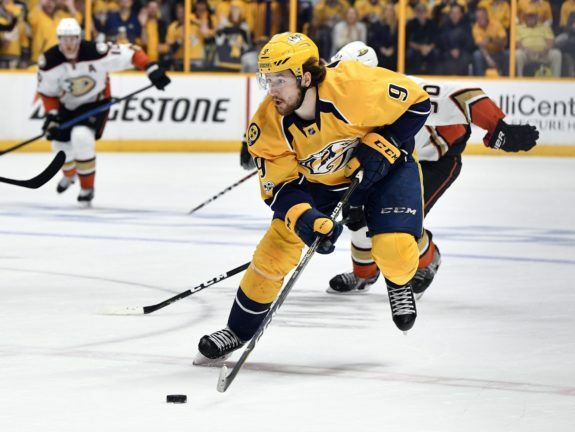 The Predators got victimized by a flawed system based on technicalities, a referee who happened to be in the wrong spot at the wrong time, and an unfriendly hop of the puck. In the end, however, the Penguins were the better team. They were patient, opportunistic, and well-coached. It’s going to be hard, but Nashville fans shouldn’t harp on the things their team can’t control. As silly as it sounds, losing is a rite of passage for a relatively new fan base. The knock on the fans in Nashville from hockey “traditionalists” from around the league was that they couldn’t possibly be “true fans,” that all the jeering against the other team is not how fans are supposed to behave (as if there were any rules), and that Nashville fans don’t know their hockey. Well, I could name quite a few more “traditional” hockey cities that couldn’t hold a candle to Nashville right now. God forbid you have passionate fans standing in the lower bowl instead of business execs staring at their smartphones. So yes, Nashville may be mourning its most heartbreaking loss, but it’s part of the growing pains every good franchise goes through. They may not realize it now, but this loss will make the next victory all the sweeter. The playoff run this Predators team just had has undoubtedly changed the franchise forever. Nashville is now most definitely a hockey town, which is something that the natives probably knew all along, but the secret is now out and you better get used to it. The unwavering, frenzied support the city of Nashville showed for their team was second-to-none. Games in Nashville became must-watch events, even for those vaguely familiar with the sport. You had people like Charles Barkley, Carrie Underwood, and Luke Bryan going on TV praising the game of hockey and what an experience it is. Endorsements like these are good. This means the game and the NHL are growing. 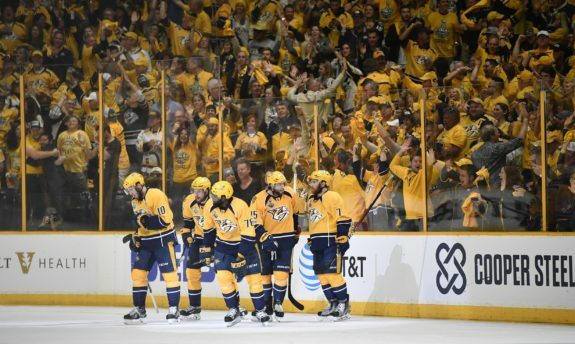 Nashville succeeding is good for hockey and even better for the NHL. This is a franchise that has remained patient and consistent since 1997, and it has a growing, passionate fan base that will only grow more loyal after a playoff run like this one we just witnessed. The Predators have a young and talented roster, and a good coach to boot. Their story is just beginning, and it’s only going to get better from here.